Lush and green, the South West has its own flavour. Explore limestone caves, national parks with towering old growth forests, spectacular mountain ranges and a glorious rugged coast. Bunbury is located 180 kilometres south of Perth on a peninsula surrounded by the Indian Ocean, Koombana Bay and the Leschenault Inlet. Inland, The Blackwood River Valley boasts some of the South West's most beautiful scenery, with picturesque towns and rich agricultural land. This world-renowned wine producing region is full of attractions, both natural and man-made. 3 hours south of Perth, visitors from all over the country and indeed the world come to sample the many delights of the area. Set amongst the tall timbers of mighty karri trees, this area is such a picturesque part of Western Australia. Approximately 4 hours' drive from Perth, you can enjoy the temperate climate, spectacular forest scenery, extensive national parks and wilderness areas that surround pretty towns. 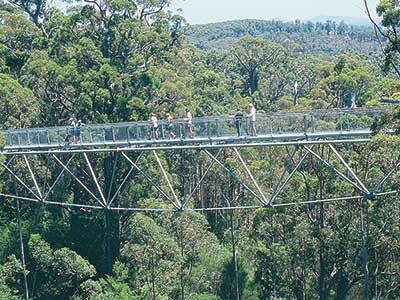 Home to enchanting karri forests that meet the rugged southern coastline in a striking contast of nature. The region has prosperous mixed agricultural areas with a variety of nature-based attractions, including wildflowers, whale watching, forests, wineries and secluded beaches.